Conrad Stoltz and Emma Garrard captured the XTERRA England Championship on a beautiful Sunday afternoon at Vachery Estate in Cranleigh, Surrey. August 24, 2014 – Conrad Stoltz and Emma Garrard captured the XTERRA England Championship on a beautiful Sunday afternoon at Vachery Estate in Cranleigh, Surrey. It was a landmark victory for Stoltz, his 50th career XTERRA championship win. For Garrard, it was her first, made all the more special with a big cheering section full of family. In the men’s race Stoltz came out of the water near the leaders (Richard Stannard was first out of the water) then blew the competition completely out of the water. He had a big lead at the 5K mark on the bike and then built on that. Funny thing was, he was bleeding everywhere, but not from crashing. The course is so tight and twisty in the forest his arms and legs just kept brushing the bush, not that he noticed. His bike split was more than three minutes faster than the next best time of Francois Carloni. Behind him a great mix of XTERRA’s elite were battling for second with last year’s champ Ben Allen, Yeray Luxem, Francois Carloni and Roger Serrano trading places. Heading into the bike-to-run transition (well behind Stoltz) it was Luxem, Serrano, Allen, and Carloni … but then Kris Coddens got to the run and chased them all down with the fastest split of the day by more than two minutes. All the while the women were having their own all-out battles. Last year’s winner Jacqui Slack led out of the water and early on the bike and was looking strong. A few hundred twists in the forest later and Garrard was in the lead with Chantell Widney not far behind. Then came along Helena Erbenova on a mission to win her fourth XTERRA European Tour Championship of the year. 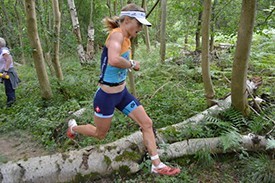 Those three – Garrard, Widney, and Erbenova – put on quite a show and it couldn’t have come at a better venue as the XTERRA England course cuts through the “arena” dozens of times so spectators and announcers can really get into the action. Ultimately it came down to the run and a “refuse-to-lose” attitude from Garrard. She posted the fastest run split by almost two minutes to capture her first major victory after four runner-up finishes in the XTERRA U.S. Pro Series (including one to Widney last month in Colorado). XTERRA England was the 10th of 11 races in the European Tour, which concludes next Sunday at the XTERRA Denmark Championship in Tisvilde. TEAM Unlimited is a Hawaii-based television events and marketing company, founded in 1988. It owns and produces XTERRA and in 2014 will offer more than 300 XTERRA off-road triathlon and trail running races in 25+ countries worldwide. In addition, TEAM TV has produced more than 300 adventure television shows resulting in three Emmy’s and 42 Telly Awards for production excellence since 1990. View samples at www.xterra.tv, and learn more at xterraplanet.com and xterratrailrun.com.